For additional information about this book, visit the website johnahart.com. The living theatre is potentially the most affecting of all the arts. It not only explores who we are and where we are going, but how we are connected. As we are inundated with other versions of mass media, we have nearly forgotten how important that connection is. We cannot afford to lose the power of this art at this time in our history. 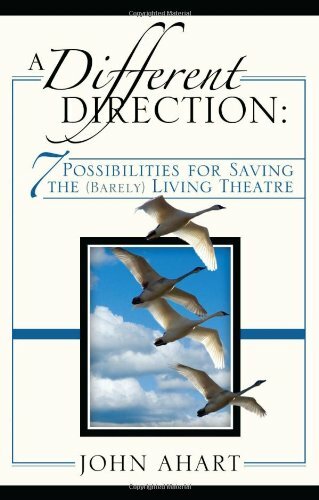 John Ahart writes A Different Direction: 7 Possibilities for Saving the (Barely) Living Theatre from the refreshingly rare place of both skepticism and hope. He is, after all, suggesting major renovations to the very institution he has called home for so many years—tools to both reimagine and reinvent this amazing living human resource. This is a book for directors, actors, designers, playwrights and in fact all those for whom the idea of an art dealing in bone-deep truth and life-changing experiences might become not only a dream but a possibility. John Ahart has had a long and distinguished career in the American theatre. A Different Direction is the product of his forty-one years of experience as director, playwright, designer, and teacher. At the University of Illinois he supervised the graduate directors’ workshop and later headed the MFA directing program for much of his thirty-two-year tenure, directing a wide range of major works at the Krannert Center for the Performing Arts. A Different Direction brings together Ahart’s insight gained through four decades of practical experience creating original works, directing theatre classics from Brecht to Beckett to Shakespeare, using and developing nontraditional theatre spaces, and building and sustaining a theatre company that gave voice to Americans, spanning 160 years of our history. Ahart holds a BA from Marietta College, an MA from the University of Illinois, and a PhD from the University of Minnesota.